Today we have something big, well no, not big, but very powerful! 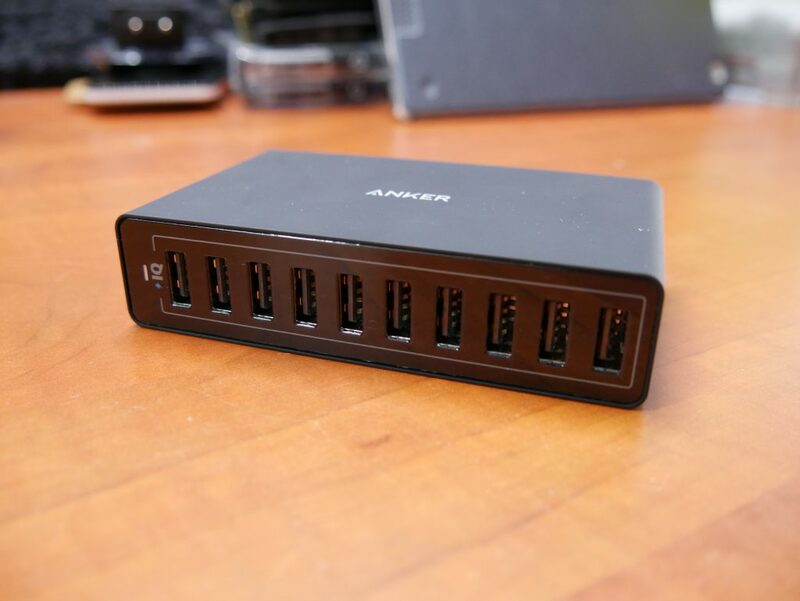 It’s the Anker PowerPort 10. 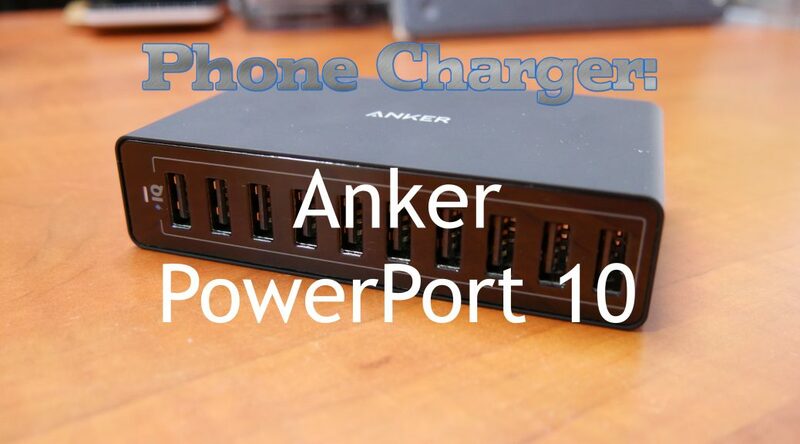 A 10 port phone charger suited for charging all your Android or Apple devices. Will it stand the full load test? To get a good impression of the unit, take a look at my video review about the unit. 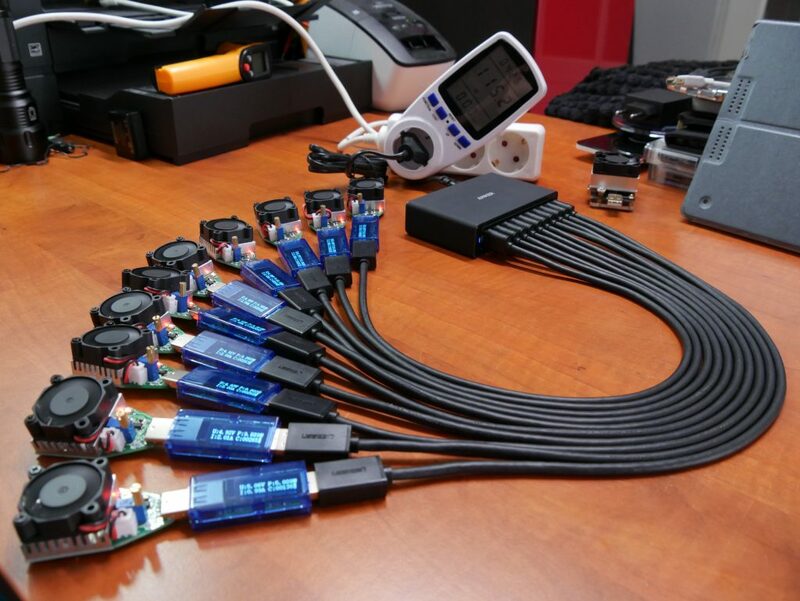 It shows you everything from packaging to a good overview of the fully loaded 10 port test setup! 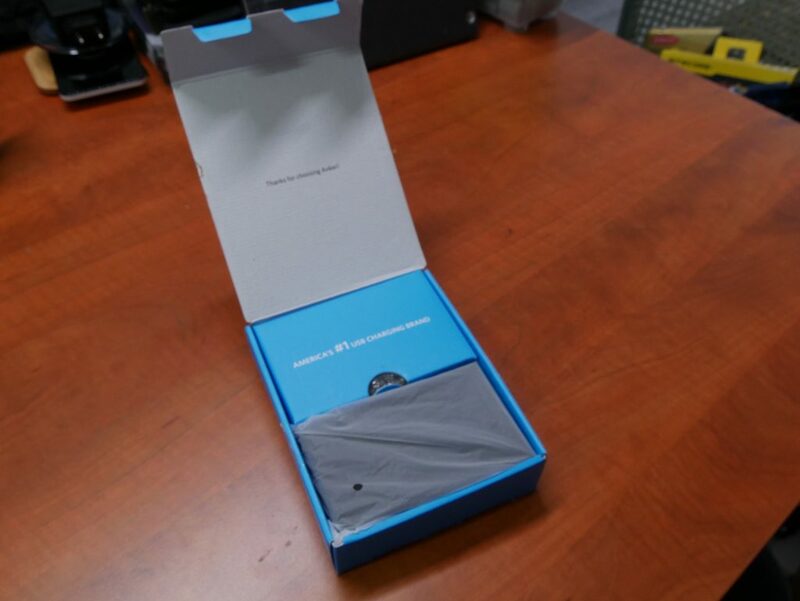 The charger comes shipped in a nice blue and white box in the typical Anker style. In this package you find you a lot included. The Anker PowerPort 10 comes with an external power cord, a few booklets, a Velcro strap and even an adhesive pad to use when sticking the charger down somewhere, very nice! As I’ve said before, I really like the chargers with a separate power cord and wide input voltage range so it can be used anywhere in the world. It also allows you to position the charger right where you need it, instead of having it hang from a socket somewhere. It also means your USB cables don’t have to be excessively long! Speaking of USB cables, take a look at my review about different brands of USB cables here. I bought this charger online at Aliexpress, you can do so by going to the whole Anker catalog here. Opening the box you see a nicely packaged very slim sized 10 port charger! A look at the unit standing up. Using the included adhesive stick this position can work very well. 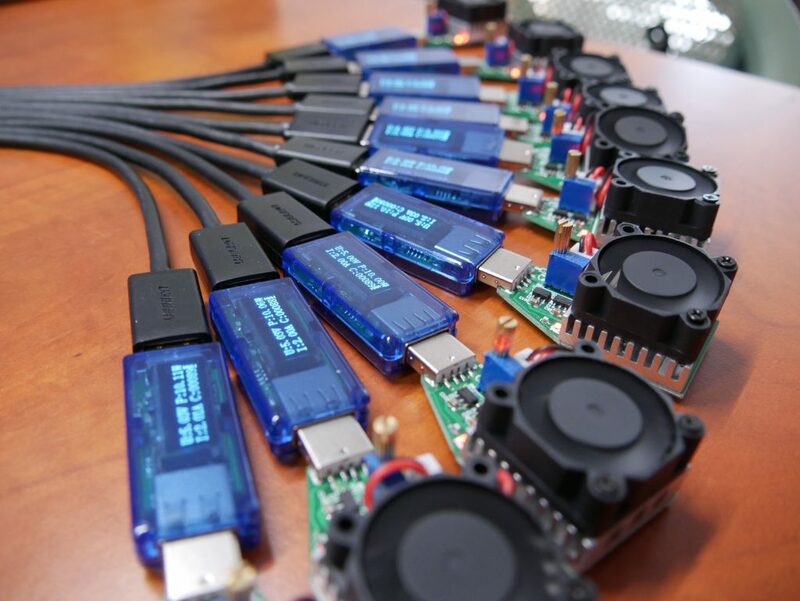 An overview of the 10 port test! It couldn’t sustain 10 ports at 5v 2A at the same time. But it did well with between 8 or 9x 5v 2A! That’s 90 watt sustained while it’s officially only rated for 60 watt in total! And it didn’t get very hot while doing so either, VERY nice! Testing only port 1 showed a very good behavior. It even includes a bit of a voltage bump around 0.6A! All in all it behaves very good up until 2.7A where the charger cuts off the port. Port 5 shows more of the same. The voltage ends up a little bit lower but there really isn’t much of a difference to speak of. Again the same but a little bit lower voltage again. It seems that the way the charger is constructed the highest voltage is on port 1 and it’s just a bit lower on port 10. Still very respectable though. With 5 ports loaded together with my EBD-USB on the first port behavior stays much the same. Each ports gets the same amount of power and voltage and amperage stay perfectly regulated. And again, even with 8 other ports plugged in using 5v 2A during this load test it behaves the same as if there is no load. Very impressive, at peak it’s pulling about 90 watt from the charger although it’s only rated for 60 watt total. Running a 90 watt load for a long time did show some signs of ports shutting off now and then so it can’t sustain that kind of load indefinitely. Pushing it down to 80 watt (8x 5v 2A) worked perfectly though! The ultimate test and here we start seeing the max load of the internal power supply. When reaching 1.8 Amps the charger completely resets itself and keeps doing so until the load is lowered. Still a very very good result and way above specifications! What an awesome charger! This charger is able to supply 80 watts of power to your charging devices all day long. 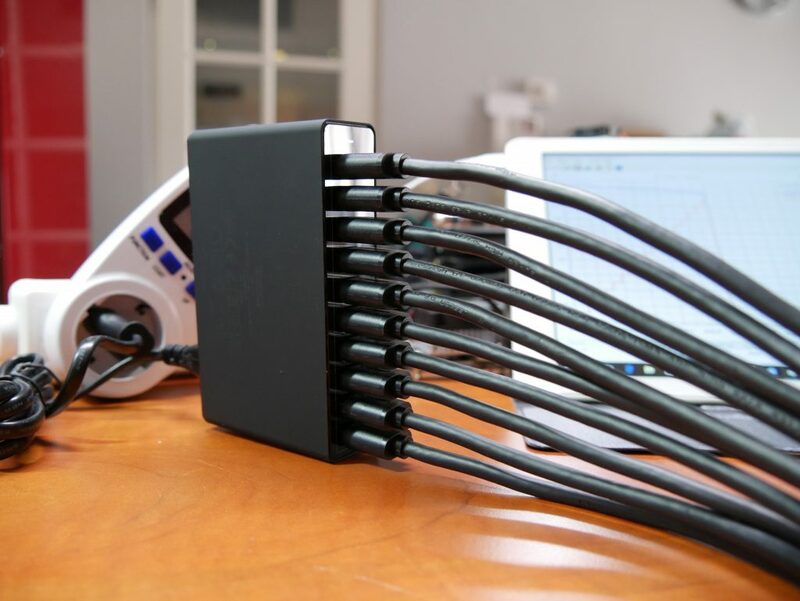 Now you might think it’s still under performing because it can’t load all 10 ports at the same time but in a real-life situation not all ports would be drawing 5v 2A continuously, if you have some Android phones or iPhone’s in the mix those often don’t ask for more then 1A or maybe 1.5A. So with a real-life mix of devices, you’ll be more then fine. Only if you wanted to charge 10 completely empty iPad’s would the charger not live up to the taks. The package, the way it looks and performs, very highly recommended!